Green Onions!!!!! are one of my favorite foods. 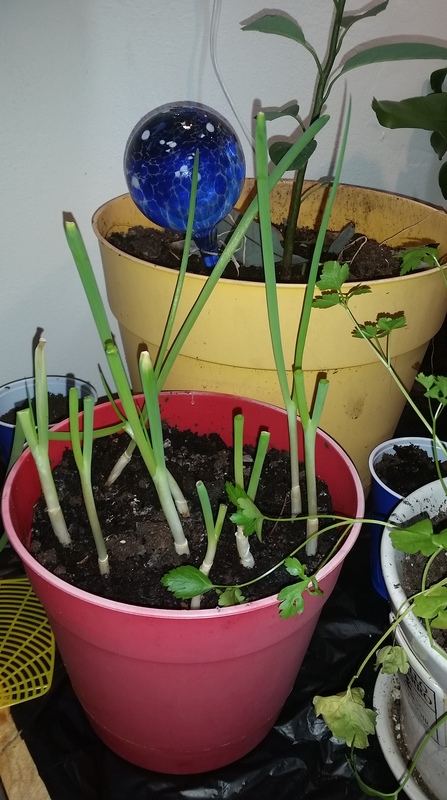 Did you know that you can grow the grocery store green onions in your own home? Simply buy a bunch or two, cut from 1-1/2 inch from the roots, and plant. First option is to grow in a glass (or wine glass for aesthetic reasons) with less than 1/2 inch of water. If you do not add any plant food, you will get 1-2 sets of new growth before it wilts. I have used indoor plant food (just a tiny bit) or coffee grounds (a pinch) to feed my onions and results are better. I’ve also used left over flower food that they attach to bouquets. It is easy to flood the onions and cause mold. If you’re just trying it out, I’d go with minimal water and monitor closely to refill. If you are lazy and will forget, just make sure only the roots are covered with water. The image shown below is the first growth after the initial cut. Another option is to plant the green onions into a pot. I used a mix of potting soil left over from the summer and some of our compost, with a few extra coffee grounds on top. I then punched a hole with my finger, put in the onion with the top exposed and pushed dirt around the plant so that the onion was tucked in nicely. 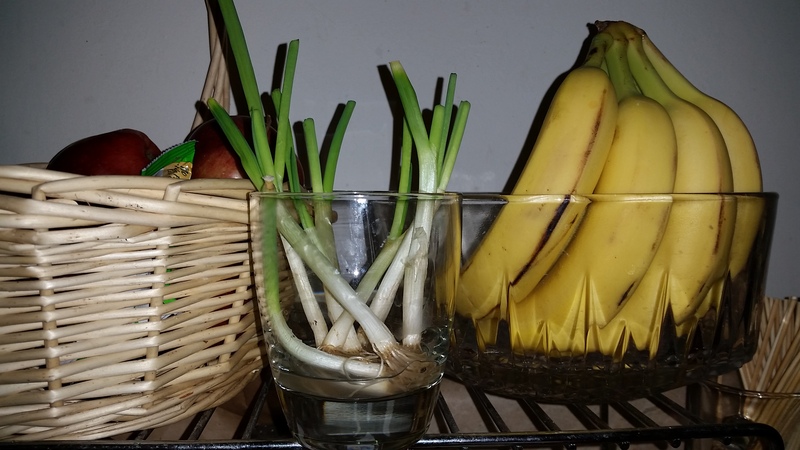 Shown below are the onions after first new growth from the original cut. Half of the onions were harvested for last night’s burritos. I have also planted the onions outside with GREAT success in cooler weather; they last a few weeks past first frost. Green onions do not do so well in the humidity of summer though, and will wilt quickly. Over time the base of the onion will form into a bulb and these are easy to replant anywhere needed. I’ve also had mediocre success with replanting romaine lettuce. Cut the bottom 1-inch up and plant in a glass until new growth is 3-4 inches, then plant outside. It wasn’t quite as satisfying as the green onions because results are slower.